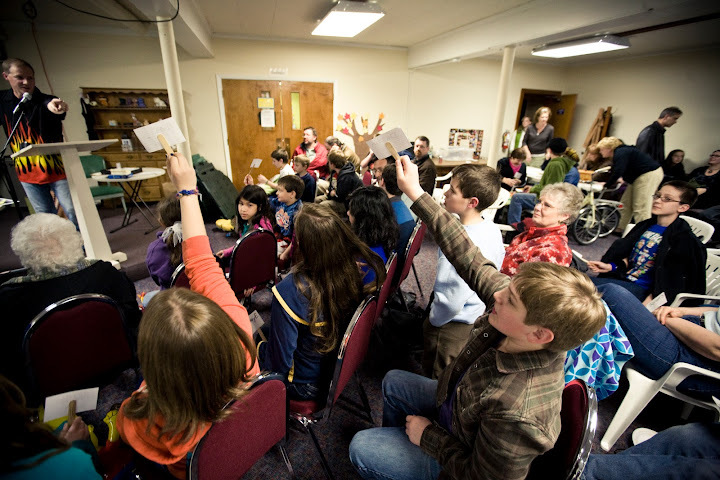 Nearly 100 excited people packed the fellowship hall for the Annual New Life Middle School Auction and raised $2556 for their Dalit Children Missions Project!! This a new record and $500 MORE than last year!! Each year the students donate their unused favorite toys and items and many members sacrificially give services like fishing trips or tea parties or baked goods or items like hand made jewelry and art, furniture and games. Then the New Life Middle School hosts a pizza dinner and crazy auction to let these items go to a new home with the highest bidder! You can check here for more pictures. All the proceeds are used by the Middle School to support the Buhlers and their adopted middle school age Dalit Children in India. Thank you so much for making this a night of ministry to remember and for your generous donations and purchases. Praise God for His Word, the power of the Resurrection and the Holy Spirit for changing lives in Middle School and around the world! !